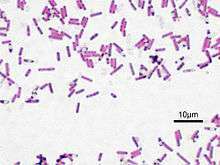 The Bacillaceae are a family of Gram-positive, heterotrophic, rod-shaped bacteria that may produce endospores. Motile members of this family are characterized by peritrichous flagella. Some Bacillaceae are aerobic, while others are facultative or strict anaerobes. Most are not pathogenic, but Bacillus species are known to cause disease in humans. Some Bacillaceae, such as the genera Filobacillus, Lentibacillus, and Halobacillus, stain Gram-negative or Gram-variable, but are known to have a Gram-positive cell wall. Genera within this family are sometimes colloquially identified as bacilli. However, this term is a misnomer because it does not distinguish between class Bacilli, order Bacillales, family Bacillaceae, and genus Bacillus. ↑ Lim, J.M., Jeon, C.O., Song, S.M., and C.J. Kim. 2005. Pontibacillus chungwhensis gen. nov., sp. nov., a moderately halophilic Gram-positive bacterium from a solar saltern in Korea. Int. J. Syst. Evol. Microbiol. 55:165-170.